Hammurabi was the ruler of ancient Babylon (795 to 750 BC). One of his most significant accomplishments was to have the oral laws and traditions written down and put on public display. All written laws and professional codes trace their roots back to Hammurabi's Code. Hammurabi's Code was the first instance of written standards. 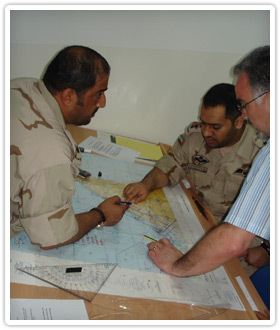 Every operation must be guided by policy, standards and operating practices. Well documented standards and regular audits ensure the safety of those in the system and allow the most efficient use of resources. Fewer accidents and efficient operations are achieved by design. We are a global, multi-faceted maritime consulting practice. We use internationally accepted processes and benchmark against both international conventions and best practices when developing solutions to meet our clients unique needs. Our first decade has taken us to fifteen countries with the International Maritime Organization, national governments, and private companies. We are comfortable presenting policy options to Cabinet and training front line personnel on ships. Through strategic alliances we have the skills, breadth and depth to help you achieve your goals. Recent projects have included assisting a Maritime Administration prepare for an IMO voluntary audit, development and delivery of training for marine casualty investigators, port security assessments, operational assessment of polar class drill ship design and Search and Rescue system development. Please explore our site and contact us to discuss your current needs.